A regional daily revived its defunct sports newspaper for one day only as part of a commercial collaboration with sportswear company Adidas. 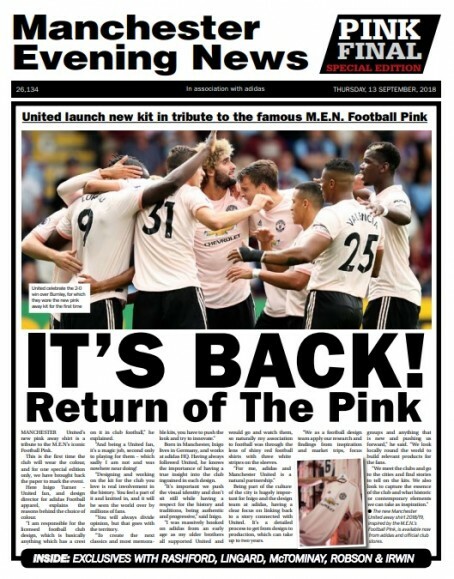 Last month Manchester United introduced a pink third kit inspired by the former Football Pink newspaper run by the Manchester Evening News until 2007. The strip went on general sale to members of the public yesterday, and to mark the occasion the MEN produced a special 16-page supplement in partnership with Adidas, which is manufacturing the shirt. Editorial and commercial staff at the MEN were involved in the special’s production, as well as newspaper sales staff and the press hall sourcing the pink newsprint. The supplement featured pieces from former MEN journalists who worked on the pink, as well as current writers. Articles were also provided by United, with content featuring current player Marcus Rashford and club legend Bryan Robson. Editor-in-chief Darren Thwaites said: “It was a great example of collaboration across all departments – editorial, commercial, marketing, newspaper sales and the press site. “It brought back many fond memories from the days when Pinks and Greens across the UK were the live blogs of their time, publishing brilliant content at a furious pace. Guy Keeble, the MEN’s head of commercial entertainments and sport, added: “This has been a fantastic opportunity to utilise our wider portfolio to match the needs of a major client on a global scale.